I have a policy. I never read something new while I’m in the middle of reading something else. I tried it once, when I was in high school, but I kept getting the stories crossed. Even though the stories couldn’t have been more different. As such, I had to wait until I finished The Wise Man’s Fear before I could read Bitter Tongue. I feel like this Tale from the Shadowhunter Academy was trying to do too much. These are short stories. So having Simon being kidnapped by the fey on an Academy assignment, only to realise that one of the fey who is holding him captive is Mark Blackthorn, the brother of Helen. Who is getting married to her long-term girlfriend before she, Helen, and Aline, the girlfriend/almost-wife, are re-exiled. There is far too much going on for anyone to really get the attention that they deserve. Bitter Tongue should have been broken up into two stories. We get a glimpse of Mark Blackthorn’s pain as he slowly forgets his family due to the mystic powers of The Wild Hunt, but we don’t get enough information. It’s a quick “yep, I’m here and going slightly mad. Remember this for Lady Midnight” and then Simon is out of there and at Helen Blackthorn’s wedding. Once there, we don’t really get to explore the delicate politics at work when the Consul is the one to give away the bride (well, one of the brides), despite the fact that the Clave exiled the newlyweds in the first place. Plus, we get introduced to the whole Blackthorn clan, plus Emma Carstairs. This is, again, much too brief. Too many characters are introduced too quickly. And, yes, I know we met them in City of Heavenly Fire, but come on. These guys are still new to us. We need more time and more information to get to know these characters properly. I have a real issue with authors trying to do too much too fast. Nothing gets the love and attention it needs and so everything is a little too stilted; too bland. That being said, I loved that the wedding was framed through Simon’s eyes; that he noticed more because he was noticing what Mark was missing. However, because of the rushed nature of the story, this frame felt more contrived than it should have. Despite the plot, the characters still sparkle. As only Clare’s characters can. But because we whizz through the story, we don’t get to spend as much time as we should on character developments. Izzy, for example. The fact that she gets caught by the fey because she was too relieved to have Simon whole and safe is something monumental. This humungous character development gets brushed over for the sake of plot. This is a huge moment, as Izzy never lets anyone in, and is always in control. This needed to be a bigger thing. I liked the content, and I love where these stories are leading us, but in order to do right by the characters, this story needed to be split so that the huge plot points could be fleshed out more. 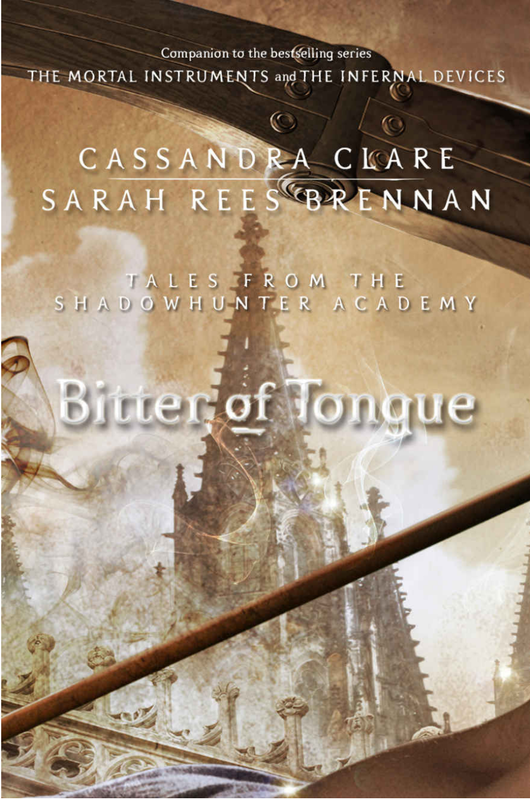 This entry was posted in Extorting Bibliophilia, My Fangirl Life and tagged Bitter Tongue, Blackthorn, Cassandra Clare, Emma Carstairs, Helen Blackthorn, Isabelle Lightwood, Mark Blackthorn, pace, plot, Sarah Rees Brennan, Shadowhunters, Simon Lewis, Sizzy, Tales From The Shadowhunter Academy, The Wild Hunt. Bookmark the permalink.